Patrick J. Smith writes - 'Pliable's On An Overgrown Path deserves the attention of almost any serious reader and lover of music, and it deserves whatever accolades can be given for his coverage of Hugo Chavez' "Bolivarian Revolution," especially as the musical world swoons over Gustavo Dudamel. Perhaps my love of Wilhelm Furtwängler should be tempered for this reason, and - as I have said here - some recordings, like that 1943 Bayreuth Meistersinger, are problematic for me - maybe that's right; however, I cannot help but think that Dudamel is a servant of a state verging ever nearer to totalitarianism and repression. 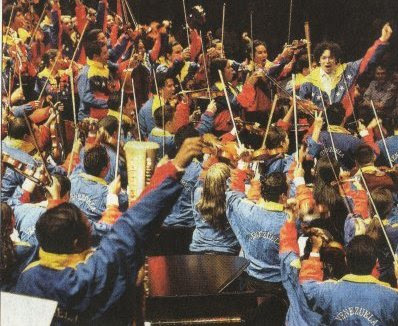 Supporting Dudamel, his youth orchestra, and other Venezuelan cultural products is akin to saying that we love the produce of a nascent dictatorship, even if we don't so much care for the dictator. Good to see that the music is prevailing, and my article on Venezuelan music beyond the youth orchestras has attracted a lot of attention. One reader from Venezuela writes to point out my omission of Aldemaro Romero, and say 'all the rest have to learn from him'. Romero died on September 15 2007. As well as working in the classical field and founding the the Caracas Philarmonic Orchestra he was the creator of a new form of popular Venezuelan music, known as "New Wave" (Onda Nueva), derived from the joropo and influenced by Brazilian Bossa Nova. You can sample Romero's music on YouTube. 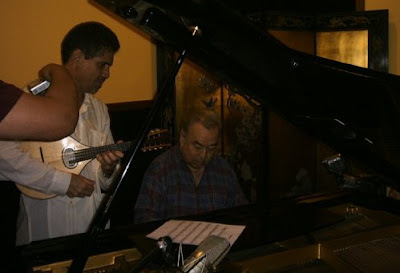 The photo below shows happier Venzuelan music making, Aldemaro Romero with guitarist Saul Vera. Strange how having an opinion is so unfashionable in some parts these days. It didn't use to be that way. 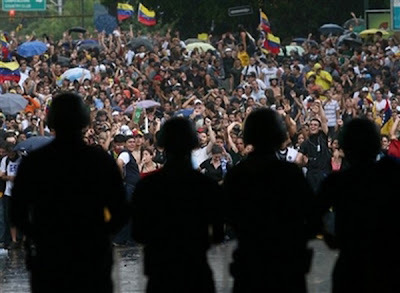 Chavez has nothing to do with the success of Gustavo and the Venezuelan Youth Orchestra. 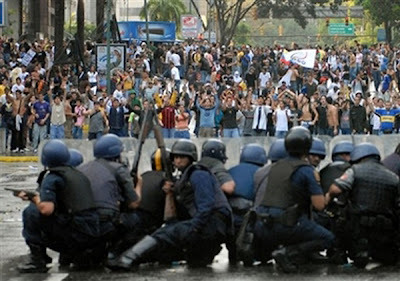 The system has over 30 years of history in Venezuela, Dudamel is not a product of the current government. Of course Chavez will try to use their sucess as propaganda, but nobody should blame Dudamel for that.